For a sweet, nutty flavor that just can't be beaten, stock your deli, cafe, or sandwich shop with the award-winning taste of this Pearl Valley Cheese 7 lb. lacey style Swiss cheese. Made from natural ingredients and part-skim milk, this Swiss cheese provides a slightly more mild taste than traditional Swiss with a lower sodium content for the health-conscious cheese-lover. The lacey style has smaller holes than other Swiss cheese and is also slightly sweeter. 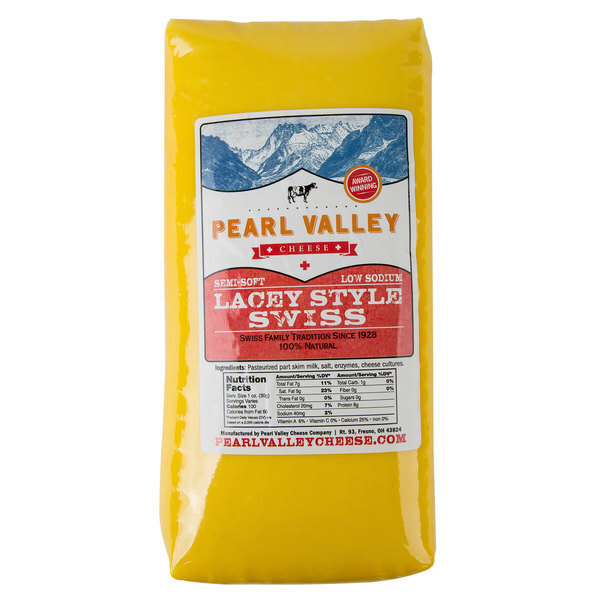 This slightly sweeter lacey Swiss is perfect for your spinach and mushroom omelet, or baked in a quiche lorraine for your brunch special. 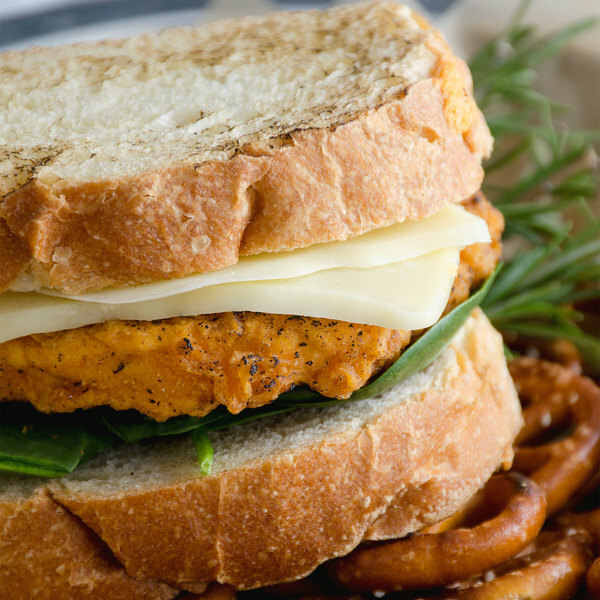 It is also great for creating artisan sandwiches, like a grilled Swiss cheese and apple sandwich, or melting to provide an authentic Swiss fondue for the entire table to share. Regardless of whether you're filling out a charcuterie board to serve alongside a bottle of pinot noir or topping an award winning sandwich, this cheese's unique, fresh taste and creamy texture is sure to please. This cheese comes in a long, 7 lb. 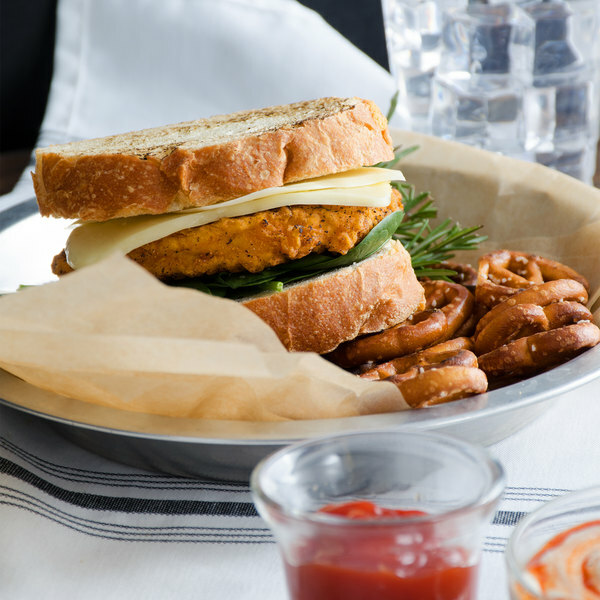 block and is sealed in durable heavy-duty plastic film wrap to preserve its freshness. Extremely versatile in its application, its semi-soft consistency can be cut into cubes, grated, or sliced thin for sandwiches. Whether it's used as a topping, garnish, or a standalone snack, this Swiss cheese is sure to be a new favorite amongst your customers. Pearl Valley Cheese, located in Coshocton County, Ohio, just south of Ohio's Amish Country, produces natural cheeses worthy of awards year after year. It is a family-owned and operated company that continually strives to exceed consumers' expectations for food safety and quality products. Plus, they are committed to being an environmentally sustainable company, and are able to reduce their power costs using micro turbines for production. With several awards to back up their claim to great tasting cheese, trust in Pearl Valley Cheese to provide flavors your customers will love. we tried this because of the price. its just as good as the alpine brand we used to use.a very strong imported type od swiss.